I know, I'm super creative with my blog titles! Teehee! 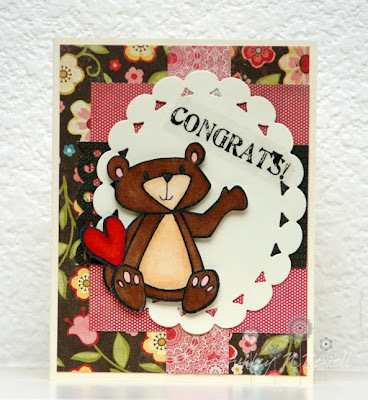 I misunderstood one of the rules over at the PaperWorks Co Blog and I've decided to blog this card now. I thought you had to make two cards to enter, but that's with the sketches only, I think. Don't take my word on it though. It's late and I'm kind of tired and my vision is slightly blurry. So, here's a card I made for a couple challenges. First, I made it for the PWCO recipe #3 which was 3 Cs: Cute, Critter, and Colors of your choice. I decided to use a cute critter and found PJ. After which, I figured out there there was a fun sketch over on TCP blog, challenge 165. I combined my CUTE image with some pretty My Mind's Eye paper (Stella and Rose Gertie) and an SRM Sticker. Adorable! I love the colors! SUPER duper cute! LOVE that coloring--and the design is so fun! Great pick--even if it's a bear that says CONGRATS:) LOVE!